Dr. James Smigielski is always staying with the newest technologies dentistry has to offer. He attends the annual dental convention and fulfills his training quota. He is a member, and in good standing with the American Dental Association. He graduated from the University of Illinois at Chicago in 1992 and has been practicing dentistry ever since. He has practiced in Riverside at his current office since 1996. A lot of his patients simply call him “Dr. Jim”. 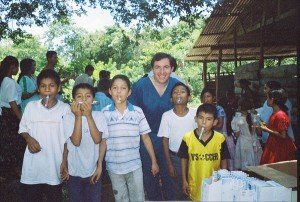 He has also travelled twice to Guatemala for several weeks in 2004 and 2005 to provide free dentistry and supplies to the local population of a small town named Gualan in the poor region of Zacappa. He has been helping hundreds of people there who could not afford to see a dentist. In his free time he enjoys spending time with his family, his wife Martina and his two young sons Logan and Jack. He is a huge Chicago White Sox fan and loves going to the games. He also has a passion for comic books, which he has been collecting since childhood. His favorite characters are Spiderman and Batman. His Assistants are Nina Marrin, Juanita Reyes and at the front desk greeds you Kathrine Koson.